The new Newton North High School, designed by Dore & Whittier Architects and Counsilman-Hunsaker features an indoor swimming pool, an outdoor stadium, state-of-the-art education wings, and a glass-walled cafeteria. The architecturally trendy zigzag shape virtually reconfigures the entire site, moving around playing fields, buildings, parking lots, and other outdated features of the high school. The new natatorium houses a 3,550 sq. 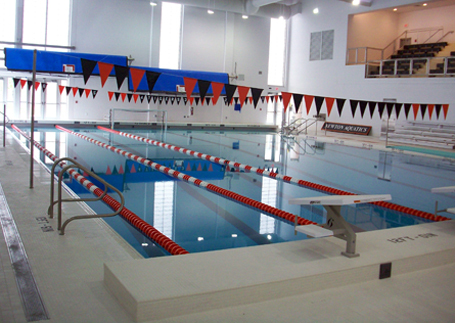 ft. 25-yard swimming pool with 1-meter springboard diving and competitive lap lanes, providing year-round competitive aquatic needs for the students.